The best Christmas market in North America? Head to Toronto. 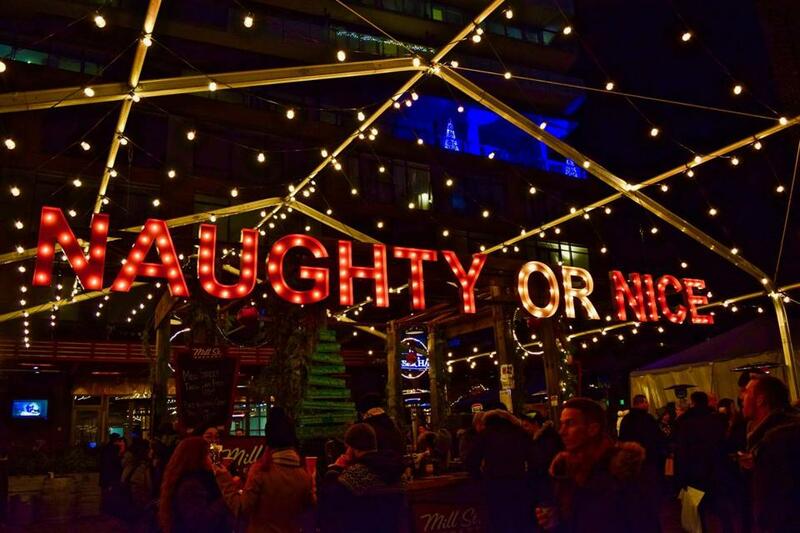 A sign over the beer hall at the Toronto Christmas Market asks shoppers if they&apos;ve been naughty or nice. 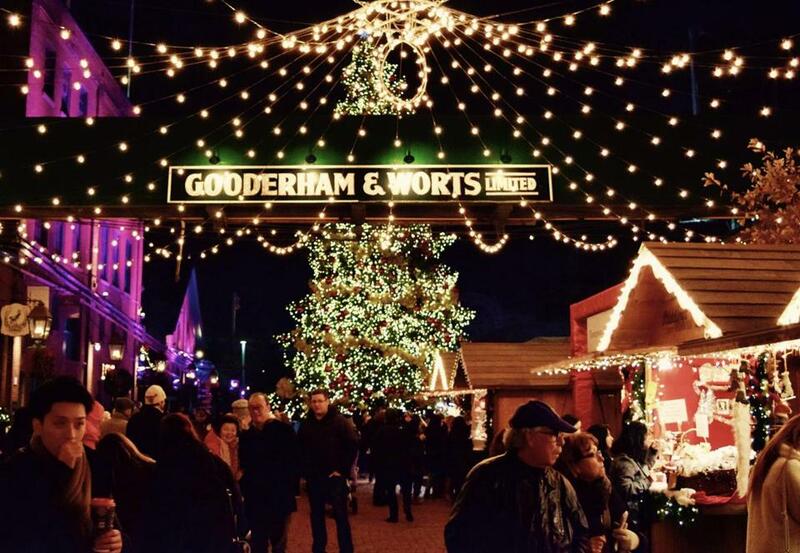 TORONTO — How do you define the perfect Christmas market? Is the ultimate market one that fulfills all of your holiday shopping requirements? Is its perfection characterized by the uniqueness of the vendors and their offerings? Should the ideal Christmas market conjure an imaginary old world Bavarian village with charm and spritzgebäck cookies to spare? While you mull those questions like a fine bottle of holiday glögg from Ikea, I’m going to jump in and offer my thoughts. The perfect Christmas market is one that warms your heart and scrapes a bit of the “Bah humbug” permafrost from your cerebral cortex. I unknowingly entered such a place earlier this month in Toronto. I knew the Toronto Christmas Market was a big deal, but I wasn’t expecting that I’d be walking into the finest Christmas market in North America. 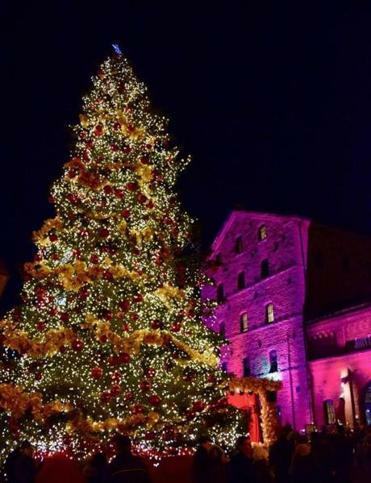 Hundreds of thousands of holiday enthusiasts come to Toronto’s Distillery District in the month leading up to Christmas for the market. This year it runs through Dec. 23. Fear not, it will return next year. Even without the market, the 13-acre Distillery District is a popular shopping and eating destination. 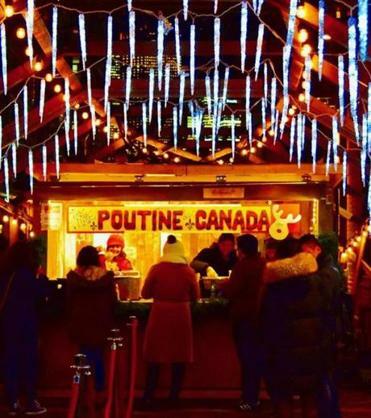 But toss in those Christmas beer halls, hundreds of locally made products, 450 live performances, Toronto’s largest Christmas tree, plus food booths that sell turkey legs, poutine, potato tornados, and an amazing treat called a Hungarian chimney stack, and you have something truly special. How can you not enjoy a market where you can walk about eating a whole turkey leg and a potato tornado? One of the focal points of the Toronto Christmas Market is the largest Christmas tree in Toronto. Before we start shopping, a few important facts about the Distillery District. It’s located at the former Gooderham and Worts Distillery. It comprises more than 40 heritage buildings and contains the largest collection of Victorian-era industrial architecture in North America. There are no snow-capped mountains in view, but with all that brick the Toronto Christmas Market feels decidedly European, albeit in a Dickensian way. Lights are strung overhead through the main promenade and buildings are dramatically lit. There’s a carousel, a Ferris wheel, and a massive disco ball. I don’t understand the disco ball, but perhaps Canada has a tradition of yuletide disco? I dropped in on a Wednesday night, in time to see the Ukrainian group Kosa Koliadnyky perform. Not the traditional Christmas tunes I was expecting, but better than yuletide disco. I thought two hours would be enough time at the market, but found myself scrambling to visit my favorite stores, the outdoor food and retail huts, plus enjoy the adult libations at the Winter Craft Beer Lounge and Gluehwein Terrace. Gluehwein is mulled red wine, and it was exactly what I needed to ward off the cold. Crowds view the shopping and food choices at the Toronto Christmas Market. I oscillated between the year-round stores of the Distillery District and the charming little huts that were evenly split between Canadian foods and Toronto-based companies. Strolling outside I stopped at Eat My Shortbread for the free samples, 6IXMAN for men’s grooming products, and Beekeeper’s Naturals, which sells health food made with bee products. Inside the Distillery I stopped at my favorite clothing boutique in all of Canada, Gotstyle, and bought some gifts for myself. I also recommend the super chic housewares store Bergo Designs. I was also anxious to check out Blackbird Vintage Finds, but there was a line to get in, as if the store were a fancy club. Customers line up for poutine at the Toronto Christmas Market in the Distillery District, Toronto. The Toronto Christmas Market is successful because it has everything you need for shopping and eating. Did I mention Hungarian chimney stacks and potato tornados? But it’s one of the best markets because of its spirit. It’s not necessarily about the shopping here, it’s about the bustle, the beautiful lights, the caroling, and unbridled seasonal cheer that it all somehow imparts.